Rescue efforts began as the weather cleared in Zimbabwe's hard-hit Chimanimani district, were infrastructure was washed away by floods. Mozambique's environment minister said the disaster could be the nation's worst. More than a hundred people have died in Mozambique and Zimbabwe in the wake of tropical cyclone Idai. Authorities in both countries warned on Sunday that the death toll could climb, as many more remain missing. Some 62 people died in Mozambique, while 65 were killed in Zimbabwe after the cyclone tore across the region on Friday and Saturday. Idai made landfall in Mozambique's central coast first on Thursday night before hitting Zimbabwe. Mozambique's environment Minister Celso Correia told news agency AFP said the deaths occurred in the hard-hit coastal community of Beira and nearby inland Dondo district. "We will certainly end with a higher toll," he warned. "I think this is the biggest natural disaster Mozambique has ever faced. Everything is destroyed. Our priority now is to save human lives," Correia said at Beira international airport, which re-opened Sunday after the storm caused it to be temporarily closed. The environment minister said the storm knocked down 80 percent of the electricity network. "All roads are cut, the infrastructure is destroyed," Correia said. 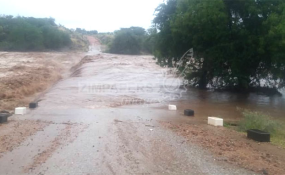 In Zimbabwe, houses and bridges were washed away by flash floods caused by the storm in eastern Chimanimani district, the hardest-hit area. Roads were reportedly swallowed by massive sinkholes, while bridges were ripped to pieces by the flash floods. Initially, high winds and dense clouds frustrated efforts to access the affected areas by helicopter. But the Zimbabwean government said the weather on Sunday had cleared and rescue operations had begun. Soldiers helped rescue nearly 200 students, teachers and staff who were caught in the flood waters and trapped at their school in Chimanimani. The UN's World Food Programme (WFP) began operations to provide food aid in the wake of Cyclone Idai. The WFP has estimated that at least 1.25 million people were in the path of the storm. Across all affected countries, communities have been cut off from supply routes, agricultural land has been devastated, and many have lost their homes and unable to cook their own food, WFP spokesman Herve Verhoosel told news agency dpa. The organization is planning to air drop supplies and use boats to bring food to those in need.